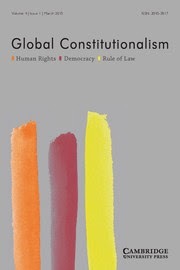 "The conundrum of unconstitutional constitutional amendments"
Abstract: National courts, largely in South Asia and Latin America, have deemed unconstitutional certain constitutional amendments that have been enacted into law in their respective jurisdictions. In the article, this author explores the normative arguments for and against the judicial enforcement of implicit substantive constraints on formal constitutional changes. In essence, the author argues that, in determining whether judges should render the substance of constitutional amendments unconstitutional, one must examine how the impugned constitutional amendment was passed. In jurisdictions where a constitutional amendment can be passed by a dominant party/coalition without bipartisan support or the general support of the people, the courts may intervene, but only where the constitutional amendment(s) in question is/are so manifestly unreasonable that such a revision is akin to a substantial destruction of the pre-existing constitution. But no constitutional amendment should ever be judicially invalidated for violating any implied ‘basic features’ of the constitution when the amendment process is particularly cumbersome and requires significant bipartisan support and the general public’s express or implicit endorsement for the amendment to pass. Click here to download the full article.